COMMONWEALTH INDEPENDENT STATES NAVIGATION INC.
As a liner service, Atlantic Ro-Ro Carriers was established in 1995 operating between the port of Saint-Petersburg, Russia and several U.S. East Coast and Gulf ports. With ARRC, the cargo arrives with no stops, no trans-shipment and no re-handling, providing shippers with the advantage of guaranteed delivery times, security and reliable infrastructure. The Line is a market leader for trans-Atlantic transit times and schedule frequency. Today, ARRC has grown into an affiliation of five companies with offices in Montreal (QC) Canada, Hoboken (NJ) USA, Houston (TX) USA, Moscow and Saint-Petersburg, Russia with a staff of over 100 people responsible for moving millions of tons of cargo. ARRC operates a fleet of modern, geared, multi-purpose, ice-class ships capable of handling a wide range of cargoes and ensuring safe and consistent year-round delivery. These types of vessels allow the Line to efficiently match a very different east-bound and west-bound cargo composition and reduce port turn-around times, cutting down the costs of operation to the benefit of its customers. As an extension to its services, the Line provides an intermodal delivery to and from any point in Canada, USA, Russia and the CIS region backed by through bills of lading and an extensive container network. ARRC is committed to provide a professional service of the highest standards. ARRC’s highly qualified team offers a flexible service tailored to the client’s individual needs. Your call is always taken in person and handled in real time. 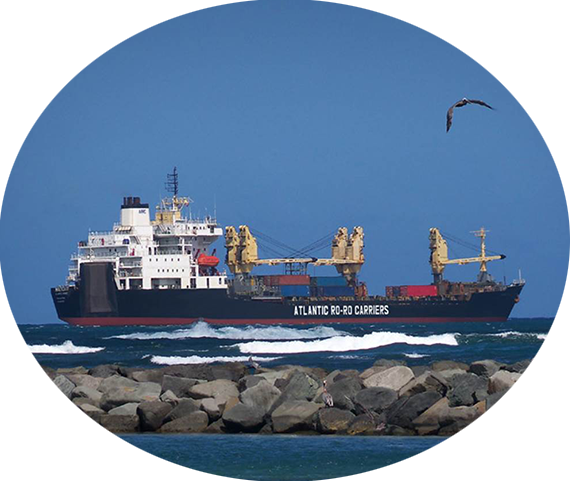 Atlantic Ro-Ro Carriers provides the only direct trans-Atlantic service between Canada, United States and Russia and offers the shortest transit time, regular sailings, and excellent performance. With ARRC, the cargo arrives with no stops, no trans-shipment and no re-handling, providing shippers with the advantage of guaranteed delivery times, security, and reliable infrastructure. Direct services from HOUSTON, BALTIMORE, MD., CAMDEN, N.J. and HALIFAX for special cargoes to and from Antwerp and ST. PETERSBURG. All Commonwealth Independent States (CIS) are being served. Accepting Ro-Ro Cargoes, Projects, Break Bulk and Containers.